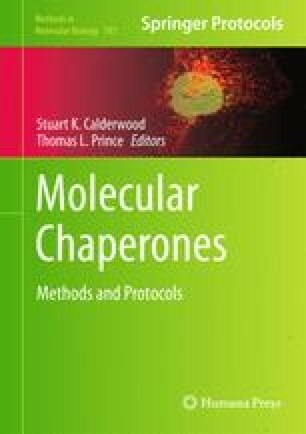 Molecular chaperones are a diverse group of highly conserved proteins that transiently interact with partially folded polypeptide chains during normal cellular processes, such as protein translation, translocation, and disassembly of protein complexes (1). Prior to folding or after denaturation, hydrophobic residues that are normally sequestered within a folded protein are exposed to the aqueous environment and are prone to aggregation or misfolding. Multiple classes of molecular chaperones, such as Hsp70s and Hsp40s, recognize and transiently bind polypeptides with exposed hydrophobic stretches in order to prevent misfolding. Other types of chaperones, such as Hsp90, have more specialized functions in that they appear to interact with only a subset of cellular proteins. This chapter focuses on the role of Hsp90 and partner co-chaperones in promoting the folding and activation of a diverse group of proteins with critical roles in cellular signaling and function. J.L.J. is funded by a grant from the National Science Foundation MCB-0744522. M.B.C. is supported in part by NIH/NIGMS grant No. 1SC1GM084863 and Grant Number 5G12RR008124 (to the Border Biomedical Research Center/University of Texas at El Paso) from the National Center for Research Resources (NCRR/NIH). The contents of this publication are solely the responsibility of the authors and do not necessarily represent the official views of NCRR or NIH.